1. Be flexible. Don't believe anything they tell you until it's actually happened. R&R starts next week? I'll believe it when he calls from the airport. He'll be home by October 16th? Try November 1st. It is stressful and it will push you to your breaking point (and it will make you write substitute plans for a week straight because you don't know when he'll be coming home)...but you will get through it. I learned at one point to not be surprised by anything the Army did, no matter how unjust it seemed. It's hard to communicate that to others though. Family, for instance, usually requires an explanation as to why you won't be coming home to visit or why he's still deployed. It's hard to understand when you're not used to the system. 2. Find a hobby. Or two. Actually, three. This should be number one on the list. You cannot, I repeat cannot, expect your husband to entertain you. Our military life began with a deployment in 2009. For four months, I anticipated homecoming, believing that all would be right with the world when that magical day came. I should've found a hobby. You are still a person. You still have interests and things you want to do and accomplish, even if you do move at the drop of a hat every couple of years. For deployment number two, I had blogging, teaching, and working out on my side. It kept me occupied for 11+ months. Along with plenty of HBO. Really, find a hobby. You need an outlet. 3. Be friendly. I'm an introvert. Meeting new people is at the bottom of my "that could be fun" list. However, I've learned that if you're new, you need to smile. You need to be kind and chatty and ask questions of people. You need to fake it if you don't feel like it. It's the only way and will benefit you in the end. There's times that Scott has introduced me to new people and I felt terrible at the time. Later, he'd tell me that "so-and-so really liked you" and I'm always surprised. If you appear to be friendly, people will like you. Then, they can eventually get to know how great you really are, especially if you're an introvert. 4. Be welcoming. On the flip side, welcome the new people. Help those who have questions. Smile. I didn't realize how much knowledge I'd gained until I met new wives who didn't know the same things I did. I'm happy to share. So many wonderful wives shared with me. It's always someone's turn to play the welcome-wagon. 5. Don't be afraid to try new things. Can you say Alaska? Or 35 acre ranch in Colorado? You can do some amazing things when you get to live all over the place. My first instinct is to usually say no when Scott comes home with a new idea (or calls from 500 miles away and says we're moving to Alaska). I do try though. I've gotten to see and do so much, just because of this lifestyle. 6. Make a career of sorts. The nice thing about the moving is that you get to reinvent yourself often. The bad thing is that you have to be on the constant lookout for opportunity. I've been lucky enough to find a job at each location and I'm not telling you that you have to work, but you need to find something to do. Seriously. Whether it's raising kids, going to school, working-from-home, going to an office, volunteer work, or something part-time. You will go insane if you don't find a purpose. Especially if you're at one of those middle-of-nowhere bases. It took me all of 3 months in Missouri to realize I needed a job. And I've tried to find a paying job at each location. Some people go the volunteer work route and that's fine too. I did that at one point but I always felt like my marketable skills were being exploited. I figured I'd better put my degree to use for as long as I can. 7. Don't try to control...anything. Ever. This goes back to #1 and something I often struggle with. A few years ago, I would get really bent out of shape when Scott would come home and tell me the latest development in what he was supposed to be doing or where he was supposed to be going. However, all my frustration and worry never did a thing for him or me. I hate to say it, but the military doesn't care how it keeps you up at night, so it's not worth the worry. Worrying just gives you something to do. I subscribe to Ma Ingalls' method: All's well that ends well. How you get there doesn't matter. 8. OPSEC. This is probably the most important advice. Operational Security. Did you know that there are cases where soldiers have not arrived home on time from deployments because wives or other family members told social media the travel information? And I'm not talking a delayed flight. I'm talking days or a week of delay for hundreds of soldiers and family members because someone felt the need to spill the travel times (probably in a grammatically incorrect way) on Facebook. I never understood what the big deal was with this. But if you look at the way terrorism has infiltrated every country in the world, it's probably best to keep it to yourself. A day delay, after a 12 month deployment, will feel like the end of the world. I'm telling you. Nothing goes as slowly as those last 12 hours. Why would you want to be responsible for doing that to other families? And please (pretty please) think before you post photos. The wrong person can gain all kinds of information from backgrounds, uniforms, etc. Especially if you're posting a photo of your soldier and there are others in the background. I try not to be too specific on this blog but, obviously, army wife is part of my identity. You just won't get a lot of dates/descriptions/locations from me. I would never throw out our address or tell you the names of my students, so I would also never give the details on my husband's job to the wide world of the internet. I even remember cropping this photo within an inch of its life because I didn't want to show the internet the background, just in case. Military wives: Anything else you can think of? This is such a fantastic post and one I'll imagine many new army wives will reference frequently! I love hearing about your experience as an army wife because I can't even imagine that lifestyle. And what you've said is so important not only for army wives, but for any wife living for her husband. It's important to be your own person and to have your own things no matter what your husband does--but especially if he's gone 9/10 of the year. For as long as we've been blog friends now, I do have to say you're quite lucky to have found a teaching job in each city you've landed in. You're definitely right with all of the above, it'll keep you going if you keep yourself busy! Great post. I don't think anyone who's not in a military marriage can begin to comprehend what it's like. I'm obviously not a military wife - heck, I was only a military girlfriend for 6 months lol, but this was very interesting to read. I can't imagine how I would do in this situation, but I know I would be thankful to have a hobby and some friends / other wives to lean on and help me out. I can't believe that people say things on social media / post photos - how selfish especially when they know the consequences! learn to make your own fun! We live in a post where there is nothing and I mean nothing around. We used to do a monthly game night with friends or have a wine and cheese parties. Something to bring people together and create something to do socially. Even when we aren't having friends over we try to do more than just sit around and watch TV. Traveling and finding things in the area or surrounding area (day trips maybe?) can really make the time at any location better. It is so easy to retreat into your own family but really getting to know people (like you mentioned) isn't a bad thing! I wish more people knew that! 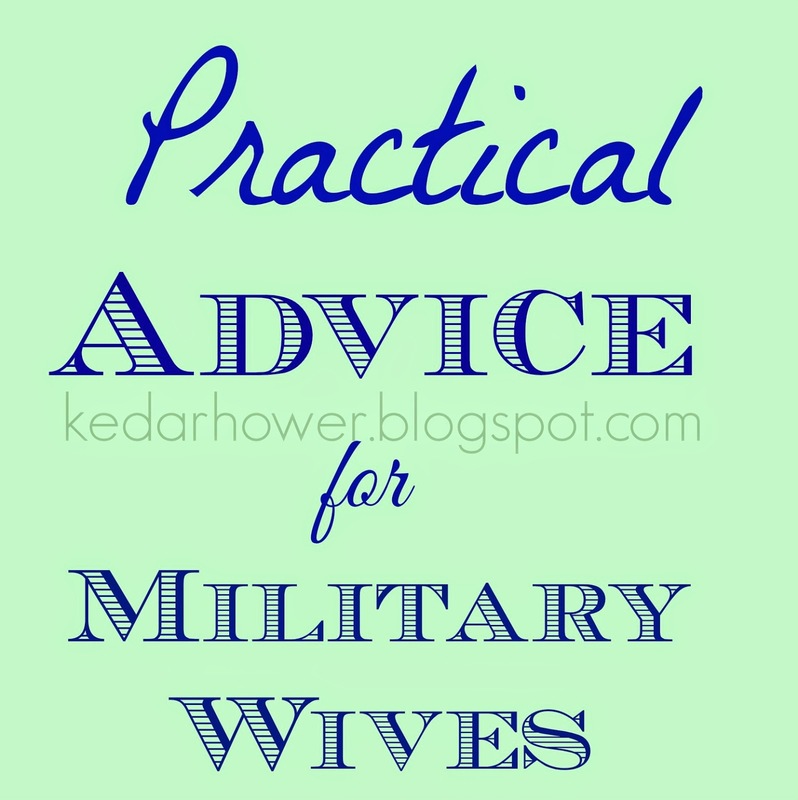 I'm not a military wife...but I feel like even a soon-to-be-LEO-wife can take all of this advice and apply it as well. ;) Great post, chica. You nailed it! OPSEC and find your own identity are two of the biggest I think. I am struggling to find friends here, but I am trying. I'll never live this life, but I think it's solid and real life advice. I hope a lot of new wives read it. Great post. I'm a military wife and agree with these. I'm not an army wife, but my sister may be one soon, so it's good to hear all of this advice from someone I respect. Thanks for writing all of this. You are one impressive and strong woman! As a vet, all these things are super important for the significant other to understand. I've talked to navy wives who get all in a tizzy over the smallest injustice and I just look stare at them and flatly say, "Why does this upset you in such a way? You've been dealing with this for 8 years now. You know the drill. Let it go and save yourself the ulcer." OMG and OPSEC, yes yes yes!!! I hate it when military member disregard OPSEC, which makes it easy to see why their significant others would as well.